The PC version of the new Assassin's Creed IV: Black Flag DLC may or may not be available by the time you read this. The Freedom Cry DLC for Assassins Creed IV: Black Flag launched yesterday and it sounds pretty cool. Set 15 years after Black Flag, it tells the story of Adewale, now a pirate captain himself, who sets out to free the slaves of Haiti after being shipwrecked on the island. 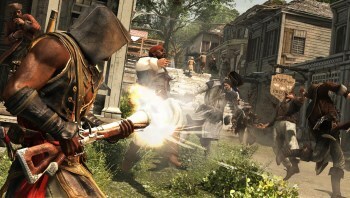 But for the moment, it seems that Adewale's adventures are limited to those who own an Xbox or a PlayStation. "The PC version of the Freedom Cry DLC for Assassin's Creed IV Black Flag will release in the coming days," Ubisoft said in a statement on the Assassin's Creed forum. "We are taking the extra time to apply a final layer of polish to ensure that it meets the expectations of our fans." Oddly enough, Freedom Cry is listed as available on Steam and shows a release date of yesterday, but there are still people on the forum reporting that they can't actually access it; even odder, the DLC isn't listed at all on Ubisoft's own Uplay service. At this point the status of the DLC is unclear and I can't try it myself (not an Assassin's Creed man), so if any of you folks have managed to make it work (or not), feel free to fill us in on your experiences on the forum.